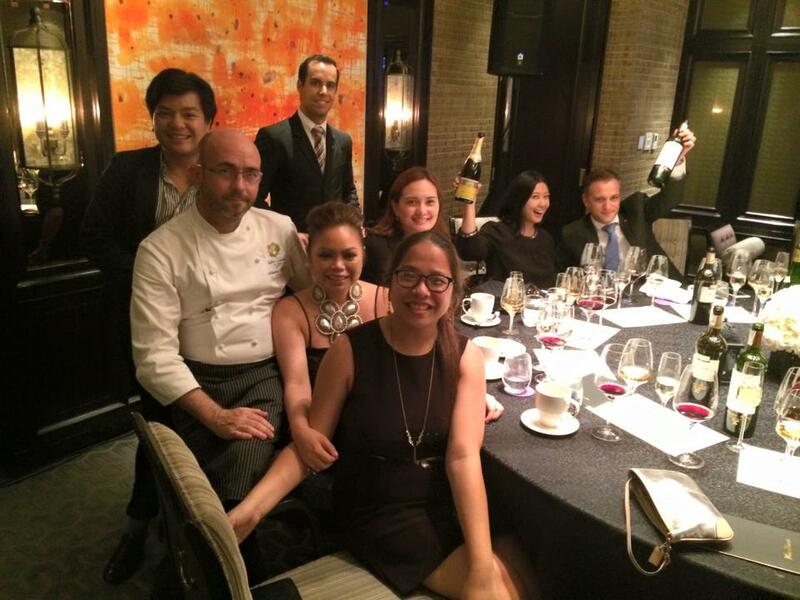 The Philippines has truly been blessed with many an excellent foreign chef this year. 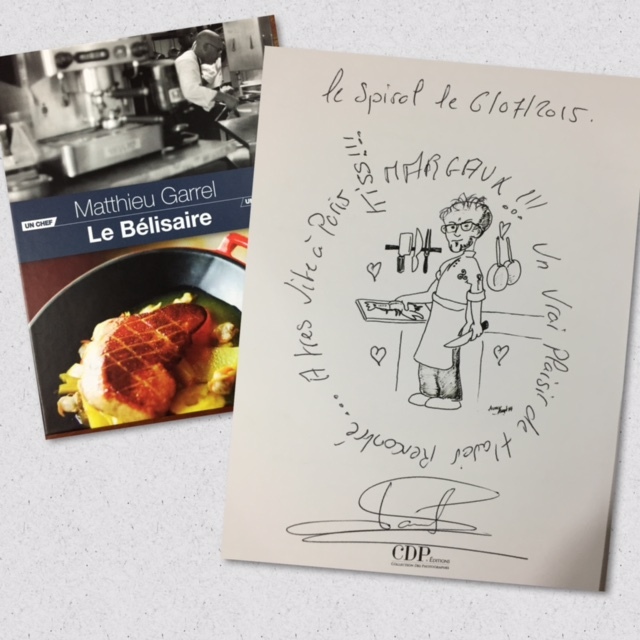 After the recent visit of French Master Chef Christian Tetedoie comes another Master Chef: Matthieu Garrel. 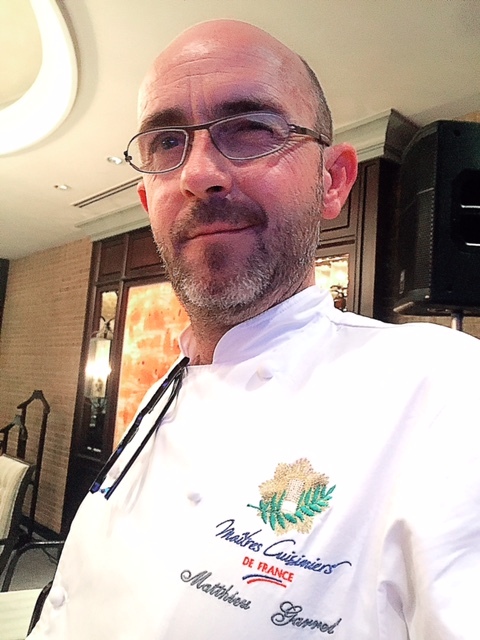 In case you missed it, click HERE for my piece in the Inquirer on the visit of Christian Tetedoie, the President of the Maitres Cuisiniers de France (Master Chef of France), the highest honor for a chef in France, in the Inquirer. Also very proud of our adopted French chef, Philippine-based Cyrille Soenen, who just joined this exclusive league of chefs this year. Thanks to Cyrille, we can now boast of having a true French master chef on our shores! I didn’t know what a delight I was in for until I noticed Chef Matthieu’s jacket. Sofitel’s PR Director Yasmine Hidalgo often holds wine dinners and I like to attend just to increase my vino knowledge so I thought it was just another wine dinner (which are always special). Turns it was an extra special night, entitled “An Evening in Paris”. “Master Chef! Oooh!” I said, as I was introduced to Chef Matthieu. “I paid for this,” he joked. That was just the beginning of a series of hilarious comments from this Master. When I asked to have my book signed, he signed at the back instead of the front page, where there is a caricature of him. Then he said, “You want a picture of me with hair?” And proceeds to draw hair on the caricature. “No need, you look like Sean Connery without hair!” I joked back. But as funny as he is, he is serious about his food, as we saw in the meal that followed. 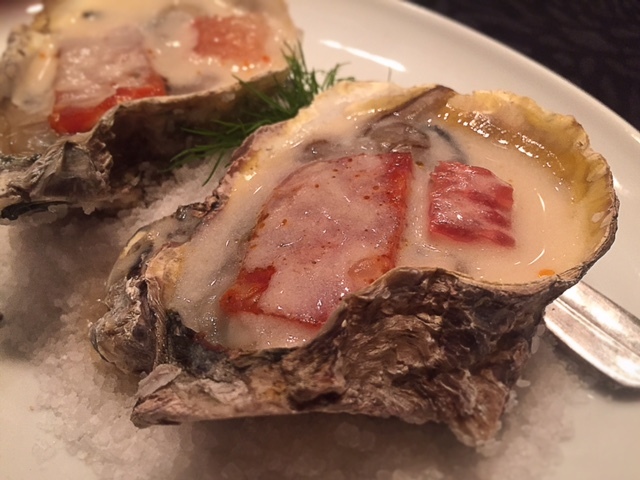 What better way to start a French dinner than with oysters? Garrel’s version, however, is made special with a champagne sauce. It also very curiously used chorizo! This was followed by a lobster ravioli. This is a signature dish of his restaurant Le Belisaire although they use langoustines. Don’t be fooled by that lobster head. It’s just for your eyes (nothing underneath). The lobster meat is neatly tucked underneath that sheet of pasta. So when you cut through the sheet, there is a burst of umami. Truly a fine dining dish. But those were just introductions to the stars of the show: foie gras. Damien Marchenay, F&B Director of Sofitel Manila, who was my seatmate at this dinner, shared that Le Bar, which pretty much works as Sofitel’s lobby, will be offering a foie gras menu designed by Garrel for the month of July, as they celebrate French month. 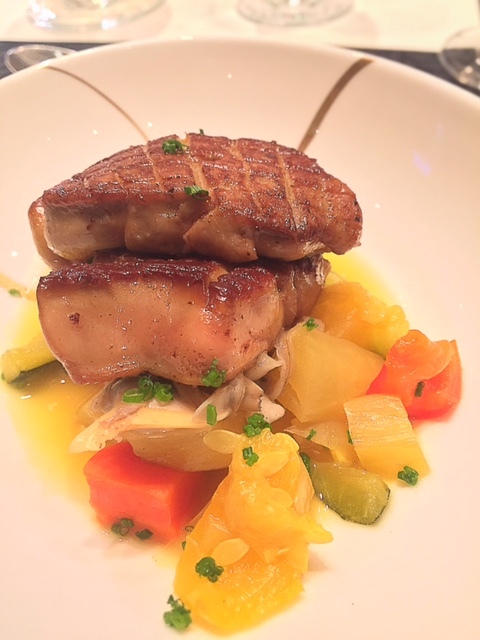 So in comes a very curious combination, another “French twist” by Garrel: foie gras with … vegetables and clams! It is deceptive. You think you are eating something not just delicious but also healthy. Such relaxed indulgence! This was paired with an 2007 Alsace Grand Cru Riesling Altenberg de Bergheim which the sommelier explained is “not Germanic but very French” even if it is a Riesling. She emphasized that it is not sweet, which is what distinguishes an Alsacean Riesling. Then the piece de resistance: Duo de Canard. Beneath that glistening piece of foie gras are layers of a puree of buttered stewed duck and mashed potatoes. This is really indulgent, a filling meal by itself. The veggies on the side obviously break the monotony of the indulgent duck. This was paired with a 2008 Saint Emilion Grand Cru. While the sommelier explained that St. Emillion is a wine that is “softer” and “more elegant”, I personally preferred the following wine, a Cotes du Roussillon by Bernard Magrez, even if it is relatively still young (2011; the most highly recommended vintage is 2004) as it was surprisingly more velvety. It is 70% Syrah. Apparently, as you can see in the photo below, I am inclined towards unctuous flavors, depicting an appreciation for wines with higher alcohol content! Photo courtesy of Yasmine Hidalgo via Facebook. Chef Matthieu Garrel (in chef’s jacket) beside Yasmine Hidalgo of Sofitel (seated with glamorous necklace). 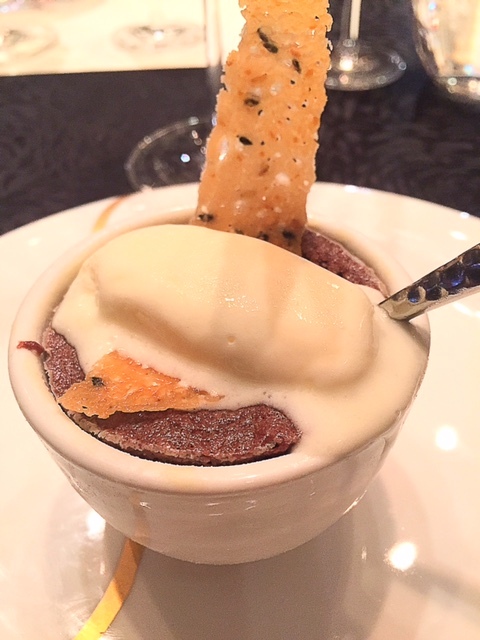 The Cotes du Roussillon Mon Seul Reve was served with the Moelleux Chaud au Chocolat du Belisair. This immediately brought me back to France. There is something about the French and chocolate. It was creamy yet definitive, i.e, the taste of chocolate was not lost in its creaminess; and rich yet elegant, i.e., hindi sabog. Loved this. Dude knows his chocolate. It was, as its title suggested, “an evening in Paris”. Garrel deserves that Maitres Cuisinieres de France title. An excellent chef indeed. If you are in Paris, check out his restaurant Le Belisaire, which is said to have been a favorite of former French President Nicolas Sarkozy. 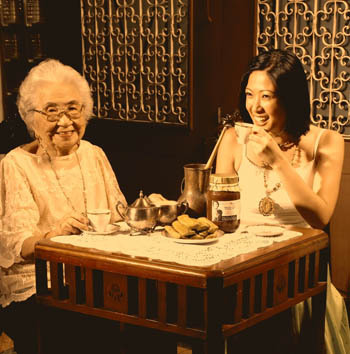 In the meantime, this menu is now offered at Spiral the buffet of Sofitel Manila. 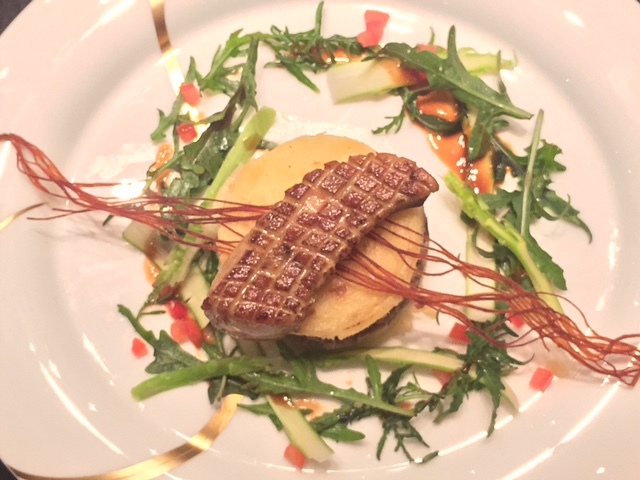 There is also a special Foie Gras menu at Le Bar for the month of July.